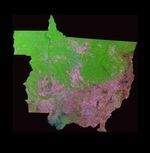 In the Mato Grosso region of Brazil, fire (red dots) is a major cause of deforestation. Slash and burn agriculture is used to clear tropical forests for farming and ranching, and this series of Moderate Resolution Imaging Spectroradiometer (MODIS) images shows the resulting transformation of the landscape. Lines and geometric shapes reveal where plots of land have been converted to agricultural uses. In many of the images, the Xingu National Park hangs like an appendage off the broad expanse of Amazon rainforest to its north. 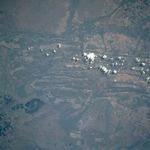 (In the image from June 5, 2002, it is at the left edge; in the image from August 22, it is centered in the image.) 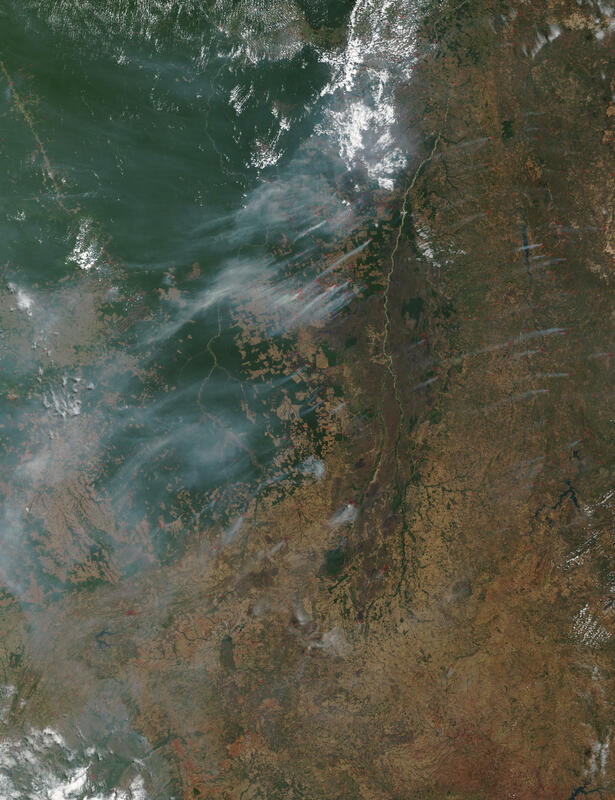 This remnant of tropical rainforest is being encroached upon from west, east, and south, and many images shows fires burning along its borders. 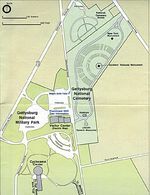 This park is actually an indigenous peoples reservation, and the people who live there struggle to maintain their traditional lifestyle under constant threats from civilization. Thick smoke hangs over the area in many of the images. This series of images begins in late April 2002, and burning is light. Over subsequent months, burning increases dramatically, and in August and September (e.g., Sept.19), fires and smoke are so thick that they obscure many regions entirely.